Blackbery users can turn your smartphone into Wi-Fi hotspots and share their Internet connection with other devices. At the end of the procedure you will require to secure your hotspot with a password. You can secure your hotspot with a password. Published by deri58. Latest update on September 6, 2013 at 06:20 AM by deri58. 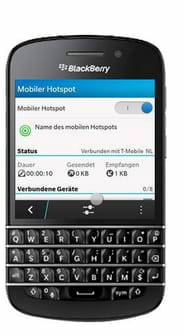 This document, titled "BlackBerry: Enable the Mobile Hotspot feature," is available under the Creative Commons license. Any copy, reuse, or modification of the content should be sufficiently credited to CCM (https://ccm.net/).